In the medical treatment of male and female pattern baldness (androgenetic alopecia), PRP can be injected into the balding scalp to potentially stimulate thin (miniaturized) hair to grow into thicker (terminal) hairs. This is a relatively newer application of PRP. It was first described in 2006 by Dr. Uebel of Brazil to enhance growth with hair transplant surgery1. Since then, basic science studies have demonstrated that activated PRP can increase the proliferation of dermal papilla cells and can stimulate extracellular signaling via fibroblast growth factor (FGF-7) and beta-catenin2. One pilot study demonstrated clinically important differences seen in 40% and 54.7% of patients, according to the 2 evaluators, respectively 3. There are very recent studies, although small, are showing that PRP is effective in increasing the number and size of hair follicles4,5. With newer techniques for isolation of the PRP and the activation of the PRP improvements in density of up to 40-56% are being obtained10. PRP can be a great choice for patients who notice significantly reduced or thinning hair or who have already maximized other medical therapies. Patients with thinning, but not totally bald, areas would be the best candidates. The use of activated PRP (using calcium to stimulate the PRP prior to injection) is now becoming more widely used as patients are getting better results with less treatments. It is conjectured that the introduction of these substances, platelet rich plasma (PRP) can amplify the body’s naturally-occurring wound healing mechanism and stimulate regeneration of tissues. -This procedure is very safe. PRP is completely autologous (derived from your own body) and does not introduce any foreign drugs or chemicals to your body. -The procedure requires just 45-60 minutes and can be done in the office under local (injectable/topical) anesthesia. -Although this is safe, PRP has not been FDA approved as a medical therapy for male or female pattern hair loss. The PRP isolation device we use is have FDA cleared. -We do not yet have large, multi-center, double-blind, placebo-controlled trials demonstrating the efficacy of platelet rich plasma for male or female pattern hair loss. Although more data is needed, there continues to be improvement especially with the activated PRP10. -Most of our data is based on in vivo, anecdotal studies and case reports. -The ideal number of treatments may vary between 1-3 depending on the patient. Laser Hair Care® 670 operates 30-laser diodes in a rotating cap, because of the rotating cap the Laser Hair Care® 670 covers the whole scalp, optimizing the treatment. By using Low Level Laser Therapy (LLLT) we stimulate the microcirculation in the scalp, which helps the follicles to produce thicker and stronger hair. In normal cases a treatment lasts for 12months, with a total of ~40 sessions. Each session lasts for 15-20 minutes. -There is evidence that skin wounding (microneedling) alone can contribute to hair regrowth. This is based on mouse studies showing hair follicle regeneration after wounding7. Clinical studies have also shown successful hair regrowth using micro needling in men who failed to respond to other therapies8,9.While the scalp is anesthetized, we recommend also making use of this additional method of hair regrowth. Laser Hair Care® 670 operates 30-laser diodes in a rotating cap, because of the rotating cap the Laser Hair Care® 670 covers the whole scalp, optimizing the treatment. By using Low Level Laser Therapy (LLLT) we stimulate the microcirculation in the scalp, which helps the follicles to produce more thicker and stronger hair. In normal cases a treatment lasts for 12 months, with a total of ~40 sessions. Each session lasts for 15-20 minutes. It can be used alone or in combination with PRP to provide the best long term results. PRP for hair loss is a relatively new treatment with a limited (but growing) number of scientific studies to show its efficacy. 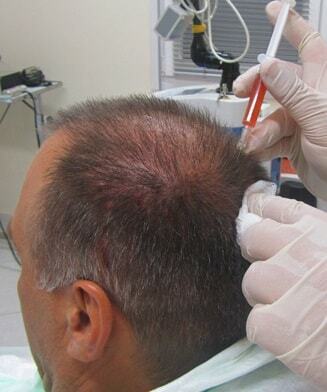 The long-term benefits of PRP treatments for hair loss are not yet known but the recent data shows significant improvement in number and size of new follicles in the treated areas. By harnessing the healing properties of one’s innate system and combining treatment modalities (PRP injections, PRP microneedling, LLLT) we maximize results with minimal side effects or risks. In our opinion it is a good option for those that wish to maximize the health of their scalp and hair to preserve and/or regain a more youthful appearance. 1 Uebel CO, da Silva JB, Cantarelli D, Martins P. The role of platelet plasma growth factors in male pattern baldness surgery. Plast Reconstr Surg. 2006;118;1458-66. 2 Li ZJ, Choi H-I, et al. Autologous platelet-rich plasma: A potential therapeutic tool for promoting hair growth. Derm Surg. 2012;38:1040-46. 3 Schiavone G, Raskovic D, Greco J, Abeni D. Platelet-rich plasma for androgenetic alopecia: Pilot study. Derm Surg. 2014;40:1010-19. 6 Rogers, Nicole. Commentary on autologous platelet-rich plasma: A potential therapeutic tool for promoting hair growth. Dermatologic Surgery. 2012;38:1047-48. 8Dhurat R, Mathapati S. Response to microneedling treatment in men who failed to respond to conventional therapy. Indian J Dermatol. 2015;60:260-63. 10Gentile P1,2, Cole JP3, Cole MA4, Garcovich S5, Bielli A6, Scioli MG7, Orlandi A8, Insalaco C9,10, Cervelli V. Evaluation of Not-Activated and Activated PRP in Hair Loss Treatment: Role of Growth Factor and Cytokine Concentrations Obtained by Different Collection Systems..Int J Mol Sci. 2017 Feb 14;18(2). pii: E408. doi: 10.3390/ijms18020408.